Adding textures to cards always produces amazing results, and when you create them with non-traditional materials like wood, the results can be fantastic! In this project, I am sharing how to color and emboss the wood pieces to make a big impact. I also used a fun frame die cut to place embellishments within and outside the lines for a fun graphic look. It is actually very easy to find a wide variety beautiful designs in wood in craft stores these days. I have this large feather piece by Unique Laser Designs. 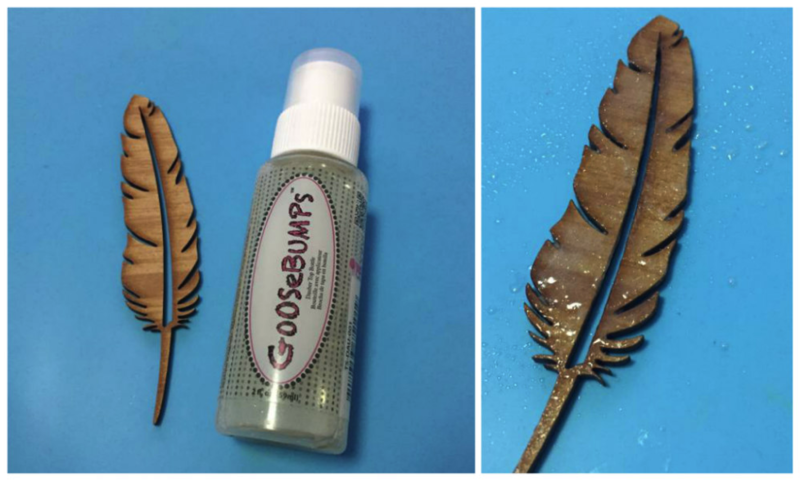 First, I applied GooseBumps with the Dauber Top and covered the surface of the feather and let dry. With the dauber top, I can control the effect which is nice for embellishments. While Goosebumps is drying, I prepared the card base and the layers of my card. I used Elegant Eggplant cardstock for the base, a decorated woodgrain paper for the second layer and whisper white for the third die-cut window layer. I cut the whisper white using a die cut from the Blueprints 27 Collection from MFT Die-namics. I pasted this layer over the base using double sided fun foam. 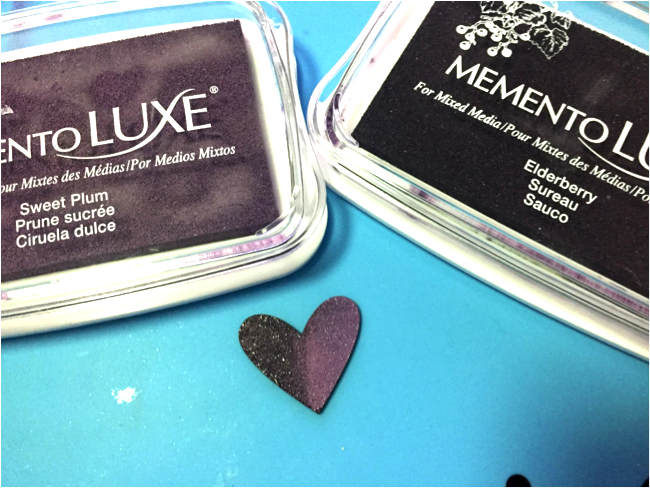 When the feather was totally dry, I applied Memento Luxe Sweet Plum on the center and Memento Luxe Elderberry on the borders, both directly with the inkpads. 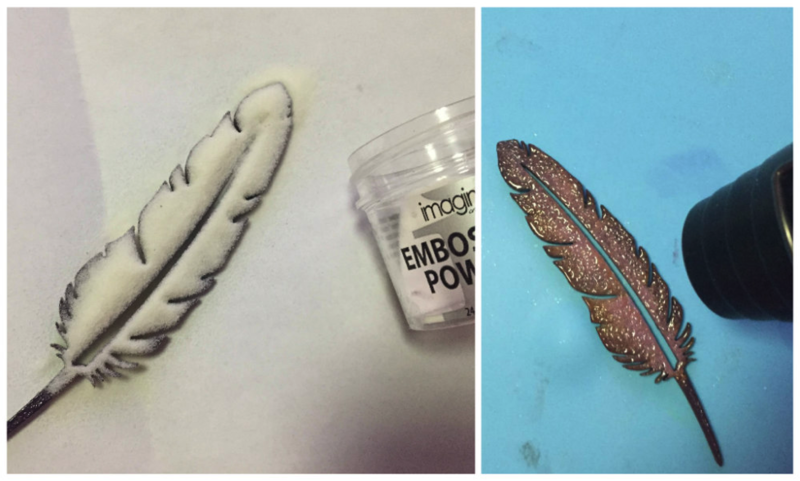 Then I covered the inked feather with Clear Embossing Powder and melted with the heat tool. Without using the GooseBumps, I repeat the ink and emboss process with a wood heart. You can see the difference in the texture by skipping the GooseBumps step. I die cut a “hello” sentiment twice using two colors of cardstock. Offset them a little and glue using On Point Glue. To finish, adhere the two wood elements over the window frame on the card. Thank you! If you enjoyed this embossing and texture tutorial then please share on Facebook or leave a comment below! 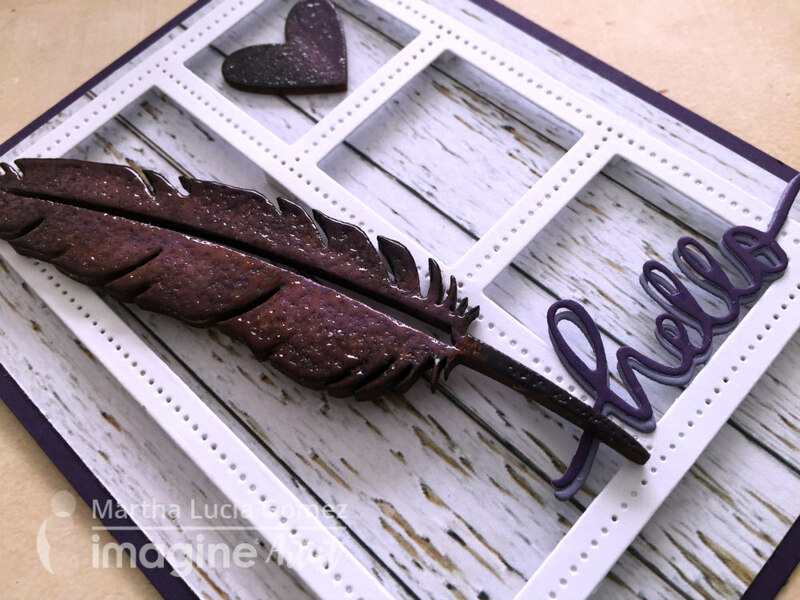 This entry was posted in Cards, DIFFICULTY LEVEL, INSPIRATION, Intermediate, Martha Lucia Gomez, PROJECTS and tagged cardmaking, Cards, DIY Inspiration, Embossing Powder, Handmade, Memento Luxe, On Point Glue, Paper. Bookmark the permalink. Oh my !! This is sooo beautiful !